Israeli forces have once again violated the territorial integrity of Lebanon by making an incursion into the south of the country. 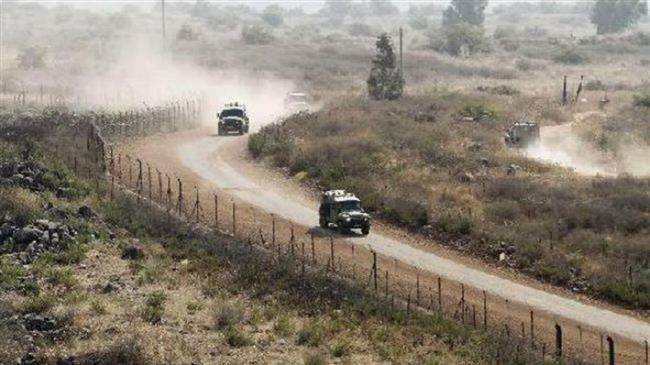 More than 12 Israeli troops on Tuesday crossed the Blue Line along the Lebanese border, advancing 100 meters deep into the Lebanese village of Kfar Shouba. The Blue Line is a border demarcation between Israel and Lebanon determined by the UN. Lebanese media say the soldiers searched the area and took some photos before retreating. “A Merkava tank stood covering the operation on a hill facing the Lebanese restaurants [near the border] while soldiers took battle positions nearby,” Lebanese newspaper The Daily Star reported. The Tuesday report added that the border violation also involved extensive flights by Israeli jets. United Nations peacekeepers stationed at the Blue Line also documented the Israeli violation. The government in Beirut, Hezbollah, and the UN Interim Force in Lebanon, known as UNIFIL, have repeatedly condemned Israel for violating UN Resolution 1701 and the Lebanese territorial integrity. UN Security Council Resolution 1701, which brokered a ceasefire in the war of aggression Israel launched on Lebanon in 2006, calls on Tel Aviv to respect Lebanon’s sovereignty and territorial integrity. The Lebanese government has filed several complaints to the United Nations over the violation of the country’s airspace by Israeli military aircraft. Lebanon’s resistance movement, Hezbollah, has reportedly arrested a high-ranking official within its ranks on suspicion of having links with the Israeli spy agency, Mossad. On Thursday, AFP cited an unnamed source close to investigations into the case as saying that three months ago the Lebanese group detained a “Mossad agent” in its ranks, identified as Mohammad Shawraba, adding that he had been in contact with the Israeli spy service since 2007. The investigations revealed that Shawraba was originally from Lebanon’s southern city of Mahrouna, but lived in the capital, Beirut. He was recruited by Israel during his numerous trips abroad. The source further said Shawraba had thwarted about five of Hezbollah’s anti-Israel operations that were planned in retaliation for the 2008 assassination of its top commander, Imad Mughniyeh, in Syria. Hezbollah has not made any comments on the report so far. Tel Aviv launched wars on Lebanon in 2000 and 2006. About 1,200 Lebanese, most of them civilians, were killed in the 33-Day War of 2006. On both occasions, however, Hezbollah fighters defeated the Israeli military and Tel Aviv was forced to retreat without achieving any of its objectives. The Tel Aviv regime launched an intelligence war against Hezbollah following its defeat in the two wars on Lebanon. Lebanese Parliament Speaker Nabih Berri says Israel is stealing oil and gas from underwater reserves off the coast of southern Lebanon. In comments published by the Lebanese Al-Akhbar newspaper on Monday, Berri said that Israel had begun siphoning gas from one of Lebanon’s maritime reserves close to its southern border with the occupied Palestinian territories. licensing for offshore gas exploration at the start of the next year. “I will do everything I can to activate this file by the beginning of the new year,” he said. Lebanon and Israel are locked in a dispute over a zone of some 854 square kilometers of gas and oil worth billions of dollars. Lebanon has been slow to exploit its maritime resources compared with other eastern Mediterranean countries. Last August, the Lebanese government delayed for the fifth time the first round of licensing for offshore gas exploration due to political disagreements. The Lebanese army has fired at an intruding Israeli reconnaissance drone flying at low altitude in the Bekaa region. In a statement, the Lebanese army said it opened anti-aircraft fire at an Israeli reconnaissance drone over Riyaq military airport in east-central Bekaa region on Thursday. “Around 10:30 am an Israeli reconnaissance plane overflew Riyaq region and army units in the area responded by opening anti-aircraft fire,” the army said. It is unclear whether the unmanned aerial vehicle (UAV) was shot down. Meanwhile, local sources said the army opened fire at three unidentified drones that had violated Lebanon’s airspace. 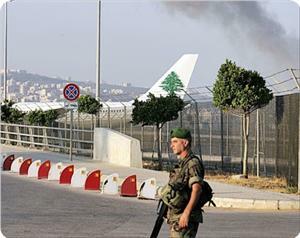 Israel violates Lebanon’s airspace on an almost daily basis, claiming the flights serve surveillance purposes. The Lebanese government, resistance movement Hezbollah, and the UN Interim Force in Lebanon (UNIFIL) have repeatedly condemned the Israeli over-flights, saying they are in blatant violation of UN Resolution 1701 and the Lebanese sovereignty. The UN Security Council Resolution 1701, which led to a ceasefire in the war of aggression Israel launched against Lebanon in 2006, calls on Israel to respect Lebanon's sovereignty and territorial integrity. In 2009, Lebanon filed a complaint with the United Nations, presenting over 7,000 documents pertaining to Israeli violations of the Lebanese territory. Lebanon's Hezbollah movement, on Tuesday, claimed a bomb attack on the ceasefire line between the two countries which wounded two soldiers. According to AFP, the group said in a statement that Hezbollah fighters "detonated an explosive device on the Shebaa hills against a motorized Israeli patrol causing a number of injuries among the occupation's soldiers." The group additionally stated that the attack was carried out by the "martyr Hassan Ali Haidar unit", named for a member who was killed on Sept. 5 when an Israeli listening device was detonated remotely as he tried to dismantle it, in Lebanon. Israel confirmed that two soldiers were wounded in the explosion, with an army spokeswoman saying that the attack took place "on the Israeli side of the border." On Sunday, Israeli troops shot and wounded a Lebanese soldier along the so-called Blue Line. 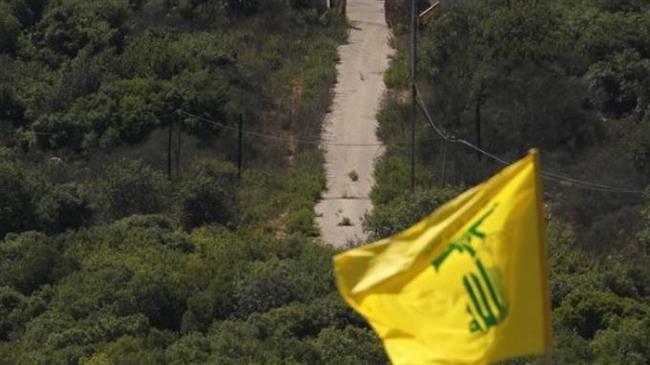 However, Tuesday's incident was the first time Hezbollah has carried out an attack against Israeli forces in the area since a bombing in March which caused no casualties. Hezbollah claimed responsibility for that attack the following month, saying it was "part of the reply" to Israeli air strikes against the group's positions in Lebanon. The Blue Line was drawn up as a border by the UN, in 2000, after Israeli troops withdrew from the region, ending a 22-year occupation of southern Lebanon. Yet, in 2006, a war between Hezbollah and Israeli troops broke out, killing more than 1,200 people in Lebanon, mostly civilians, and some 160 Israelis, mostly soldiers. 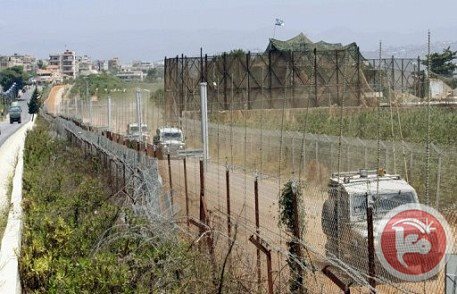 Israeli troops shot and wounded a Lebanese soldier across the ceasefire line between the two countries on Sunday, a Lebanese security source told AFP. The source said the soldier was hit when a Lebanese army patrol came under fire in Jabal Sadanneh, west of the disputed Shebaa Farms area. The Israeli army, however, said that it had fired at suspects crossing the border from Lebanon into Israel. "Earlier today, during a routine activity along the Israel-Lebanon border, an (army) force identified suspects crossing the border and infiltrating into Israeli territory," the army said in a text-messaged statement. "The force responded by opening fire towards the suspects, who escaped north, returning to Lebanon." It did not comment on whether the Lebanese army had returned fire. The Shebaa Farms area is located at the junction of Lebanon, Syria, and Israel and has been occupied by Israel since the 1967 Middle East war. Tensions regularly break out between Israeli and Lebanese troops along the so-called Blue Line, the ceasefire line drawn up by the UN in 2000 after Israeli troops withdrew, ending a 22-year occupation of south Lebanon. Last year, Israel accused a Lebanese army soldier of opening fire across the ceasefire line and killing one of its troops in what UN forces stationed in the area called an "individual action." 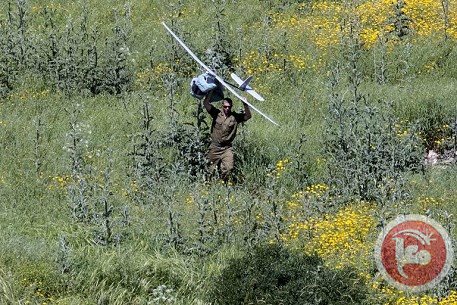 An Israeli drone crashed inside Lebanon on Saturday, reportedly coming down more than a dozen kilometers on the other side of the border. "The drone crashed on the Lebanese border, inside Lebanese territory. Lebanese troops are in the area," a military source told AFP. A military source told the Lebanese newspaper Daily Star that the plane fell in the Saradah Valley, about 15 kilometers north of the Blue Line that demarcates the border between Israel and Lebanon. 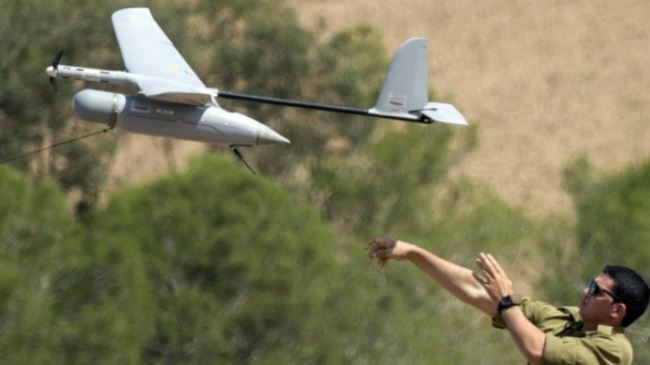 An Israeli military spokeswoman confirmed the incident, saying that the drone fell "during a routine security mission along the border" after suffering a "technical malfunction." "The circumstances of the incident are being reviewed," she added, noting that she could not confirm how deep inside of Lebanon the plane had hit. Israel routinely flies its planes and drones across the border over Lebanon, in direct violation of UN Security Council Resolution 1701 that ended a 2006 war with Hezbollah. Lebanese officials say that the violations come on a nearly daily basis, with the ominous buzzing of drones and fighter jets a routine part of life across the south and even in the capital Beirut. In February, an Israeli drone crashed on the Blue Line, the UN-demarcated line between Lebanon and Israel. Israeli soldiers crossed into Lebanese territory during that incident to retrieve the wreckage. The Blue Line was drawn up in 2000 by the UN after Israeli troops withdrew, ending a 22-year military occupation of south Lebanon. A projectile fired from Lebanon struck northern Israel early Friday causing no harm or damages, the Israeli army said. "One projectile hit an open space near Kfar Yuval, between (northern Israeli towns) Metula and Kiryat Shmona," a military spokeswoman told AFP, adding the army did not yet know whether it was a mortar shell or a rocket. 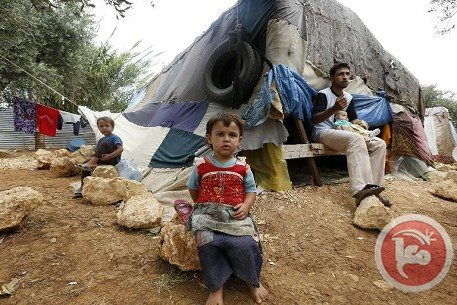 Lebanon is acting in a "blatantly discriminatory" manner by denying access to Palestinians fleeing the conflict in neighboring Syria, Amnesty International said in a report on Tuesday. The watchdog said Lebanon has imposed increasingly onerous entry requirements at the border with Syria and that there was evidence it is trying to prevent Palestinian refugees from entering via Beirut airport. "The Lebanese government's policies and practices towards Palestinian refugees from Syria have led to a range of serious human rights violations," said Amnesty. "The policies -- which treat Palestinian refugees from Syria differently to other refugees -- are also blatantly discriminatory," it added. Lebanon is hosting more than one million refugees from Syria, or about a quarter of its population. Amnesty acknowledged that hosting the refugees put Lebanon under "immense strain" and criticized the international community for failing to provide more support. But, it said, there was "no justification" for the different treatment of Palestinians from Syria, who also represent a small number of the total population that has fled the Syrian conflict. The group said Palestinians seeking to cross the border from Syria were required to meet one of several criteria that were "extremely difficult and costly." And the report documented instances in which Palestinians said they met the criteria laid out, including a residency permit and proof of relatives living legally in Lebanon, but were still denied entry. In one instance, a woman who had returned to Syria to give birth, was denied the right to return to her family staying in Lebanon. In another, the parents of a 12-year-old returned to Syria to renew their identity documents, leaving their son in Lebanon with his uncle, but were subsequently denied reentry. And, the group said, a document leaked from Beirut's airport advises all airlines to avoid carrying any Palestinian passengers from Syria, regardless of the documents they have. It threatens airlines with a fine and the cost of deporting passengers if they fail to comply. "The policy set out in this document constitutes a clear breach of international law," Amnesty said. Lebanon's government has denied there is any blanket decision preventing the entry of Palestinians from Syria. Amnesty said it received no response from the government to its queries about the letter and incidences of denied entry. There were approximately 500,000 Palestinians in Syria before the conflict, with refugee camps including Yarmouk in Damascus directly afflicted by the fighting. Lebanon has urged the international community to compel the Israeli regime to stop violating the Arab country’s sovereignty. 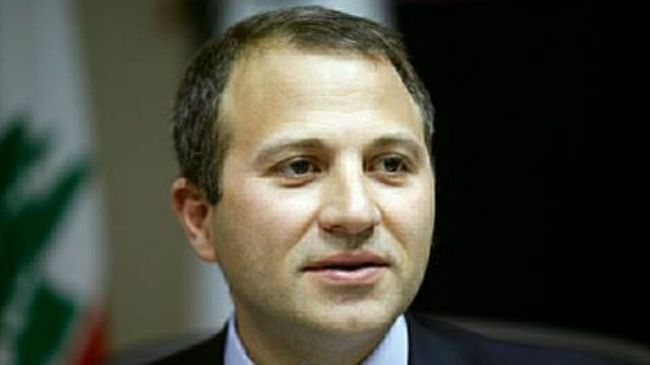 “Lebanon calls on the international community to prevent the continuation of Israel’s [acts of] aggression [against Lebanon] and violations of Lebanon’s sovereignty through air, sea and land by Israel,” Lebanese Foreign Minister Gebran Bassil said in an address to the 17th Non-Aligned Movement (NAM) foreign ministerial conference in the Algerian capital of Algiers on Wednesday. Lebanon’s resistance movement, Hezbollah, the government, and the UN Interim Force in Lebanon (UNIFIL) have repeatedly condemned the Israeli over-flights, saying they are in clear violation of UN Resolution 1701 and the Lebanese sovereignty. The UN Security Council Resolution 1701, which brokered a ceasefire in the war Israel launched on Lebanon in 2006, calls on Tel Aviv to respect Lebanon’s sovereignty and territorial integrity. The Lebanese foreign minister further noted that there would be no peace without justice, stressing that no justice would prevail under the shadow of aggression and occupation. “The policy of the present government of Lebanon is neutrality in regional and international conflicts, but this policy does not include resistance against occupation and fighting terrorism,” he added. Bassil also extended his gratitude to Iran for the Islamic republic’s efforts for the NAM, particularly during its presidency of the movement. The 17th NAM foreign ministerial conference kicked off in Algiers on Monday. Iran took over the chair of the movement in 2012 and will hand it over to Venezuela in 2015. The Lebanese security authorities on Saturday arrested eight Palestinian asylum seekers on allegations of using forged travel visas, while the renewed armed violence in Yarmouk refugee camp in Damascus led to a halt of food aid distribution. According to a report issued by the action group for the Palestinians in Syria, the Lebanese general security arrested eight Palestinian refugees at Beirut airport at the pretext of using bogus entry visas. The group said that the Lebanese attorney general issued orders to deport them to Syria. In another incident, the distribution of food parcels in Yarmouk camp was suspended by the UNRWA after the outbreak of new armed clashes between the warring parties there. The action group also noted that the Syrian political security apparatus kidnapped a Palestinian young man named Ahmed Qassad from his workplace in Al-Aideen refugee camp in Homs.